« HOW THE WEST WENT BUST…. Honestly, you would need a heart of stone not to LAUGH at this image of an exploding windmill in Scotland. It appears it was the wrong sort of wind wot done it! I notice the BBC reported it without any additional comment…. Shame there wasn’t a few beeboids up there. By the way what the F*** is Prescott doing at the Climate change conference, he’s not in power any more and why is Newsnight wasting time interviewing the fat slapper shagger. Joan Walley, (Labour Stoke on Trent) is chair of the Commons environment select committee. She brought him along. He has no role except to sample the pies and hold forth to the BBC. Is he her pet then ? “Well, blow me down and bugger me with a pogo stick if that clever hubby of mine didn’t go and surprise me with QUITE the oafiest oaf that ever was spawned ! Grease oozing from every pore and table manners that would make a hyena blush ! I could hardly wait to tear the wrapping off and behold my prize ! This picture should be sellotaped to David Attenborough’s coffin as it trundles into the shale gas powered inferno. I presume this turbine was nowhere near a populated area? I am surrounded by these white elephants. I shudder to think what would be the consequences of the same happening here. I hope you’ve all voted in the DM’s poll on is the BBC biased on Climate change? Seeing polar bear cannibalism being blamed on climate chnagew, too. Odd, as every TV doco on predators I have watched seem to have been based around the danger to cubs from adults, ranging from roaming males being genetically partial to post-natally compromised females. Oh, I did laugh when I saw this on Newsnight. Not so funny was seeing that ghastly Junket John spluttering about carbon and wine bottles. In the Great Storm of 1703, Defoe reccords 400 windmills being blown down or catching fire after the sails turned so fast the friction caused overheating in the wooden components. You’ d have thought they had sorted that glitch out, after 300 years. I thought they had auto-braking cut-offs for just such a thing. That these usually kick in quite a lot, resulting in no generation, goes to the difference beween installed capacity figures used by some (with relatively attractive farmland rental deals or others with pension-based investments) and how many electrons actually get squirted down the pipes. If I was a religious nut I would say that this was God’s opinion on Greeny issues, but I’m not so I’ll just say “ha ha ha”. So thats two less bird murdering monstrosities isnt it? No doubt the windmill fraud profiteers will be enrich themselves with the insurance payoff. Someone call Greenpeace and tell them there’s an instance of burning rare earth metals of unknown toxicity being released into the atmosphere. Have them come and occupy this site and force its closure. that by so doing you were seeking to save the environment. ROBERT BROWN; Would be nice to see people with access to explosives going round destroying these contraptions. Bet you do not see any near Mr Huhnes’ dwellings, and what the hell are the pathetic CPS[ Criminal Protection Service ] doing with his case, looking for some long grass to kick his case into? The BBC have an article on the incident now. It comes with what seems to be an amateur video of the windmill catching fire. There’s a short commentary that basically tells you the obvious, and naturally avoids any editorialising. Note no shock horror in the article itself at the the first line, which, if it would have been an issue that the BBC were against, we can be sure a counter would have appeared. Renewable energy experts today dismissed an incident where a wind turbine caught fire in gale force winds as a “freak” occurrence. 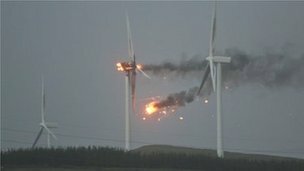 The 328ft (100m) tall turbine, at Ardrossan Wind Farm, near the A78 in North Ayrshire, was destroyed after it exploded into flames. The BBC’s James Cook said the flames could be seen for miles around. A fwe hundred thousand quid up in flames, on an anyway controversial agenda – ‘just dismiss it – it’s a ‘freak’ occurence’.